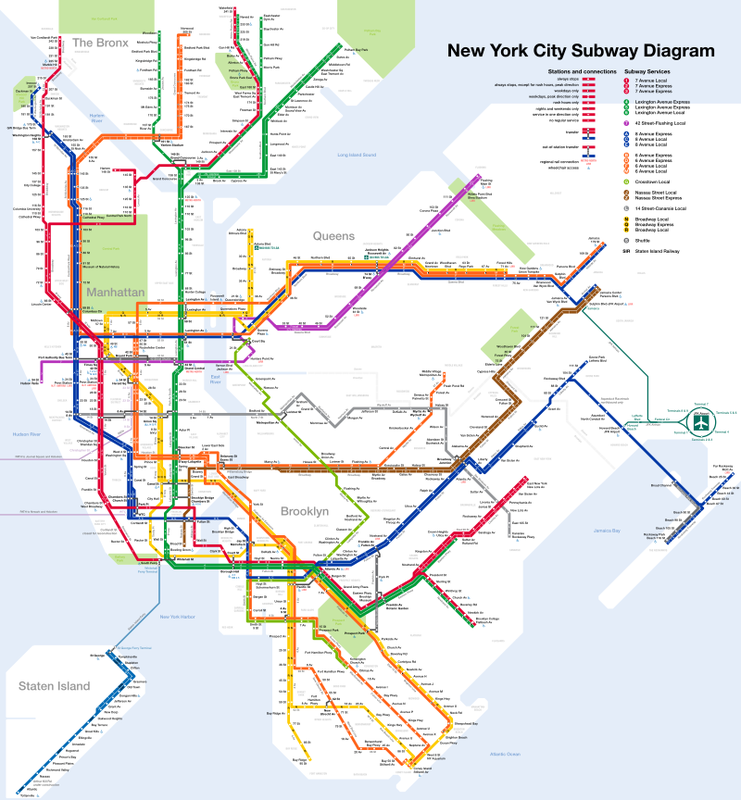 Map of New York City Subway showing various lines and stations. Click on the map to enlarge it. One of the oldest metro networks of the world, the New York City Subway began setting the benchmark very early on, since 1904. Most number of stations covered, one of the busiest networks in the world and the busiest metro network in the USA, are some of the accolades that this almost historic means of public transportation has won in the past century. It runs on 34 lines, serves 469 stations and has a track length of more than 1,300 km. The ownership of this vast network lies with the city of New York, however, it’s operations are looked over by the New York City Transit Authority. As the 7th busiest metro system in the world, the New York City Subway has an annual ridership of 1,762,565,419 passengers (2015). A metro network that always seems to be in the expansion stage, there are a couple of more lines in the planning and construction phase as off today. The New York City Subway is one of the few metro networks that operates for all the 24 hours in a day, on an everyday basis. The frequency of the trains though, differ according to the day and time of the day, as well. Trains on the lines have a minimum headway of about 2-5 minutes during peak hours, which extends to 10-20 minutes at other times. The metro system follows a ‘pay per ride’ system irrespective of the distance travelled and the time taken to complete the journey. This means that the riders have to pay once, when they enter a station and can transfer between trains without paying any extra fare. If they exit a station and enter again, the fare needs to be paid. Riders can pay using MetroCard that has to be swiped at the entrance of the subway system, and does not have to be swiped at exits. The MetroCard is a stored value card and can be charged at stations booth or vending machines. A single base fare for adult is $2.48 when paid with a Pay Per Ride MetroCard. Without the Pay Per Ride option, a single ticket costs slightly higher at $3.00. Passengers can also purchase 7-day or weekly cards for 31$.The discounted price or reduced fare for this card is 15.50$. It provides unlimited rides for seven consecutive days after the first use. A 30-day or monthly card can be purchased for 116.5$. The reduced fare is 58.25$. This card provides unlimited rides for a period of 30 consecutive days after first validation. The reduced fares are only applicable for the elderly citizens of the age 65 and above, and those people who have some credible disabilities. The metro provides park and ride facilities at most of its stations for its passengers. All the stations are fully equipped to handle passengers with disabilities, especially for those on wheelchairs. One of the things to keep in mind while waiting for the trains on the platform is to position yourself at the center of the platform and not too close to the tracks. Personal care assistants and guide dogs/animals are also allowed to accompany the disabled people. For the same reason, almost all the stations are equipped with escalators and elevators as well. No matter how valuable something might be, it cannot be as valuable as your life. So stay away from the track lines, even if something falls and is lying on them. The standard rule of holding on while standing on board the train is applicable too. Those travelling with baby strollers need not worry at all, the network is extremely accessible and looks after the needs of as many passengers of their as they can. Bicycles are allowed to be carried on board. The entire route of the subway system is not built completely underground. The metro lines are similar to that of the train route. The lines or routes are recognized by letter or names or by number. New York City Subway system offers 24 train services to the passengers. The present network system serves 4 or 5 boroughs of New York City. ● IND Sixth Avenue Line – The bright orange line is of B division and it runs under Sixth Avenue in Manhattan towards Brooklyn. B, D, F and M provide services through this route. ● IND Eighth Avenue Line – The blue line is a part of B division and it was the first line of independent subway systems. The line runs from 207th street in Inwood towards south of High street in Brooklyn Height. Lines A, C and E provide services through this route. ● BMT Broadway Line – The yellow line is of B division and it is served by three services N,Q,R. The line operates between east of the Lexington Avenue/59th street and south of Whitehall Street-South Ferry. ● IRT Broadway Seventh Avenue Line – The red line is one of the line that stretches from South Ferry in Lower Manhattan towards north of Van Cortlandt Park- 242 Street in Riverdale. The line serves 1,2 and 3. ● BMT Canarsie line – The gray line is about BMT division and it served “L” train all the time. It operates between Eighth Avenue Roackaway Parkway. ● IND Crosstown Line – The line belongs to B division and it offers service between Brooklyn and north western Queens. “G” offer service through this line. ● IRT Flushing Line – The purple line operates as a part of IRT division and it is designated as route 7. The line operates between Flushing and Main Street Times Square. ● IRT Lexington Avenue Line – It is one of the lines of IRT division operating from Downtown Brooklyn towards 125th street in East Harlem. The line is served by 4,5, and 6. ● BMT Nassau Street Line – The line is of B division and served all the time by J and Z. The line operates between Essex Street and Broad Street. ● Shuttles – The line is designated as S and it offers short services to passengers during off hours, late nights and weekends.